Movie Trailer, Photos and Poster for The Way, Way Back. Steve Carell, Sam Rockwell, Liam James and AnnaSophia Robb star in the coming-of-age comedy. See the movie trailer, photos and movie poster for The Way, Way Back below. Over the course of his summer break, 14-year-old Duncan (James) comes into his own thanks in part to the unexpected friendship he strikes up with Owen (Rockwell), one of the park’s managers. Running Time: 1 hr. 43 min. MPAA Rating: (PG-13), for thematic elements, language, some sexual content and brief drug material. 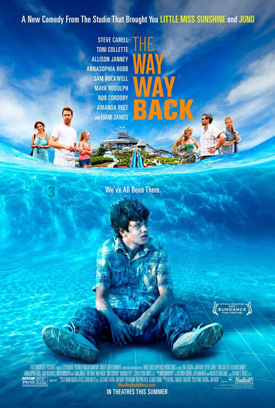 THE WAY, WAY BACK is the funny and poignant coming-of-age story of 14-year-old Duncan’s (Liam James) summer vacation with his mother, Pam (Toni Collette), her overbearing boyfriend, Trent (Steve Carell), and his daughter Steph (Zoe Levin). Having a rough time fitting in, the introverted Duncan finds an unexpected friend in gregarious Owen (Sam Rockwell), manager of the Water Wizz water park. Through his funny, clandestine friendship with Owen, Duncan slowly opens up and begins to finally find his place in the world—all during a summer he will never forget.